This Bree Engineering RF diplexer displays low insertion loss, high return loss, and high rejection across the specific frequencies on both channels. The Diplexer contains a high pass from common to Channel 2 with a Lowpass from common to Channel 1. The combined response allows for consistent Return Loss to be greater than 17 dB across the lowpass passband. The high pass passband extends out to 25 GHz with some trade-offs in return loss and insertion loss as the filter increases into the higher frequencies above 18 GHz. The response of the RF Diplexer allows for low insertion loss to be less than 0.75 dBa below 5.95 GHz and greater than 3.8 GHz. Less than 1.0 dBa from 7.6 GHz to 18 GHz and then drops to being less than 2.5 dBa from 18 GHz to 25 GHz. This Diplexer can also sustain rejection to be greater than 40 dBc through the entire performance of the high pass ranging from 7.6 GHz to 25 GHz. 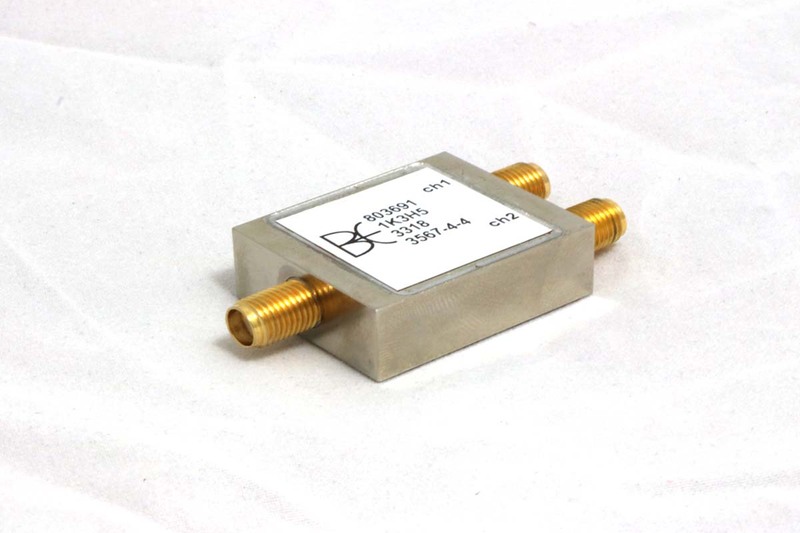 The lowpass rejection is greater than 50 dBc within the range of 3.8 GHz to 5.95 GHz. Please feel free to reach out to us at Bree Engineering with any questions or comments regarding any of our custom filters and we will be happy to answer them.